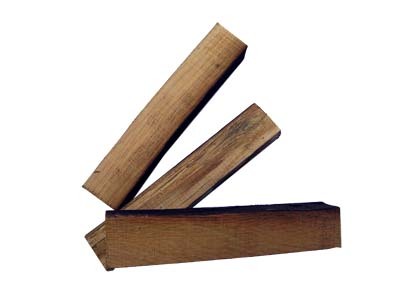 These pen blanks, made from seasoned oak (Quercus robur), are cut from caskets or barrels that have been used to store both Jack Daniels and Jim Beam whiskies. Both blanks come with a certificate of authenticity stating that the blanks are genuine pieces of oak cut from the relevant barrel. On opening the bag, there was a strong aroma of alcohol and although the oak wood was definitely aged, the whiskey had soaked into the blanks causing some slight condensation in the bag. Each blank is square and measures approximately 25 x 11mm (25 x 7/8in). For the two blanks provided, I decided to make two slimline pens but of two very different shapes. The reason for this was that I needed to see if a thicker pen resulted in a stronger aroma when used due to the greater area for the alcohol to soak in, and also to test how long the aroma lasted for. 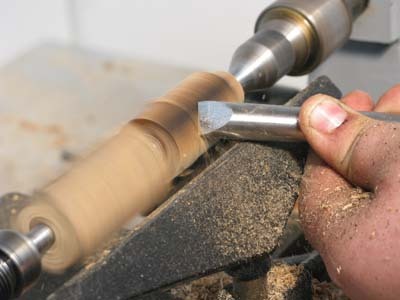 The first tip when preparing the blanks is to be very careful when drilling for the tube. Because of the non-square section of the wood, it is necessary to have a firm grip to make sure that the drill does not wander or stray off course. If there is any possibility of skin reaction to the alcohol or burnt wood, it would be best to wear rubber gloves during the whole preparation and turning of these specialist blanks. When turning, there was a very nice aroma, but I would suggest having good ventilation in the workshop to prevent any accidents - or maybe not depending on how good a day you've had! I found that a sharp skew chisel was ideal for turning these blanks which produced a very good finish direct from the tool. For the larger pen, the black burning on the wood did create quite a nice effect where it had penetrated below the wood surface, whereas the smaller diameter of the thinner pen was a normal oak colour. One of the most important tips with these blanks is the finishing technique. Following sanding through the grits, I did not use any sealer, wax or any other finish. Any finish would almost certainly stop the alcohol aroma coming off when using the pen. I did find that although the pens did not smell strongly of alcohol once turned, the aroma did improve as they warmed up in the hand when being used. The thicker pen did tend to have a stronger aroma once warm but because of its size, it did take a bit longer to warm up. Overall, a very interesting idea and these blanks can be turned into very nice unique pens of any design. At £2.75 each, including the certification of authenticity, these are good value for money and are ideal as a present with a difference. I must admit that there are many fantastic materials and kits available for turners to amuse themselves with, but it has to be said that if you are looking for something different then these blanks add a certain something that will no doubt be appreciated by the drinkers of relevant spirits.